We have family coming into town next week (yay! ), so we decided to celebrate Easter a week early. I've been wanting to do more to celebrate Holy Week for years now, and this year I am finally implementing a few ideas. I'm sure we'll work out the kinks over the next few years and it will evolve over time, but I hope the week leading up to Easter will become one of the most meaningful weeks of the year for our family. Tonight after Conference, we gathered as a family and had a short devotional (which we will have each night this week). 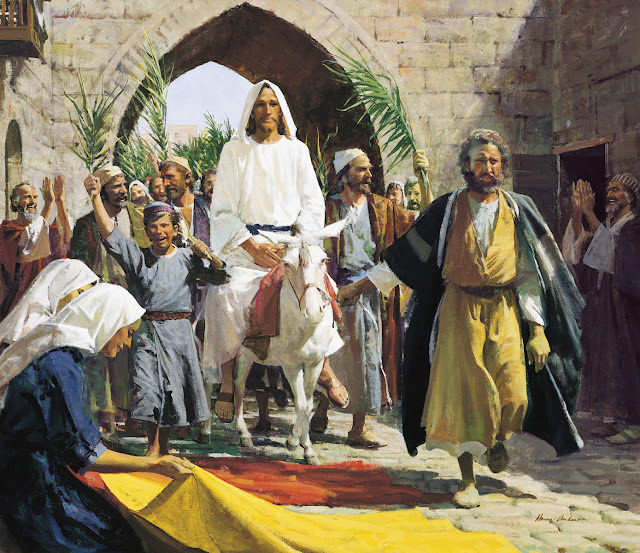 We began by opening a wrapped package, which was the picture above, of Christ's triumphal entry into Jerusalem. We then read Matthew's account of that event, and then we made palm leaves out of green poster board and the boys spread clothes along the ground in a path. We stood on either side of the clothes, waving our palm leaves and singing a "Hosanna" song from "Scripture Scouts." Afterward, we talked about how just as the people of Jerusalem welcomed Christ into their city, we can welcome Him into our lives. We wrote on our palm leaves one way we will invite the Savior into our lives more fully this week and we watched the Bible video of Christ's triumphal entry (see below). Each night we will open another picture of Christ's last week on Earth and display them together in our home throughout the week. To be honest, the boys were a bit silly throughout tonight's devotional, and they were restless and ready to be done with the day, but hopefully a little bit of the message sunk in.